Running and Swimming for a Playground in Uganda! With financial support from Irish Aid, ChildFund is currently working on a programme to improve early childhood development (ECD) in Uganda. A new ECD centre for children has been built in Okwece in mid-Western Uganda. It lies approximately 225 kilometres Northwest of Kampala, Uganda’s capital city. 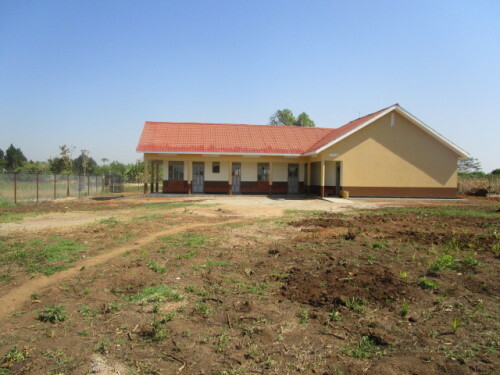 The Okwece centre (pictured below) is the only ECD centre that meets basic standards in the area, but it is not complete yet: it needs playground materials! Playgrounds provide crucial and vital opportunities for children to play. Emotional, social, motor and cognitive learning is accelerated, facilitated, and fuelled by the pleasure of play. Aside from the positive impact it has on children’s development, we should not forget also that every kid deserves to laugh, to have fun and to be happy playing with their friends! The new ECD centre at Okwece in Kiryandongo, Uganda. We want playground facilities to fill this picture and we want children playing there! In November our colleagues Clodagh Byrne, ChildFund Ireland’s Programme Officer, and Brendan Kenny, ChildFund Ireland’s Chairman, took part in the Great Ethiopian Run in Addis Ababa, the capital city of Ethiopia. They were running to raise funds for the playground in Uganda. We would like to sincerely thank everyone who has already contributed to this great cause, which to date has raised over €1900! The costs to fully equip the centre with a swing set, climber, slide, see-saw, platform and a merry-go-round amount to €4,600 – as we are nearly halfway there, we need just another €2,700 to reach our target! As Christmas is a time for children to enjoy their free time and to play, it seems appropriate to be fundraising for a playground which will provide young Ugandan children with a space and opportunity for them to play with their school mates. After all, every child deserves to laugh, to have fun and to be happy playing with their friends! Please make a donation now if you can! Donations can be made by credit or debit card through our website or over the phone – please call us on 01 6762128. Postal donations should be marked ‘Run’ and sent to ChildFund Ireland, 22 Windsor Place, Dublin 2. As part of our fundraising campaign, Clodagh and Brendan will be swapping the arid heat of Addis Ababa for the wet and decidedly icy waters of the Irish Sea! They will be joined by other ChildFund staff and board members for a swim at the Forty Foot in Dun Laoghaire on Saturday 19th December at 3pm. If you are in the neighbourhood please drop by and say hello, it’s always great to meet our sponsors in person. Better still, come in and join us for a refreshing dip! You will not only be contributing to something that will make a big difference in these children’s lives, you will be doing so in good company – Ireland’s only chess grandmaster Alexander Baburin will also be joining us on what promises to be a fun day. Thank you for your continued support and a very Happy Christmas from all at ChildFund! You Are Here: ChildFund Ireland > Blog > Running and Swimming for a Playground in Uganda!